The Christians who started this Country knew what it meant to give "Thanks" to God. 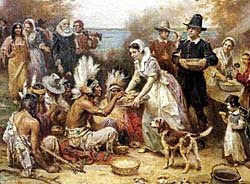 As the Godless people continue to rewrite the History of our nation we start to demean things like Thanksgiving and they start adding falsehoods about the celebration, in each of these revisions you hear about the "horrible people" who came to settle this Country. When in reality not all the people were bad and in fact most all of them were here because of their belief in God. From Christopher Columbus realizing the world was round because of the Bible to, the Puritans preaching the Gospel freely here, even being missionaries to the natives. So it is a good reminder to give "Thanks" to God for all that he has blessed us with and the fact that his Grace is sufficient for those who trust in Him. The heart that is constantly over flowing with gratitude will be safe from those attacks of resentfulness and gloom that bother so many persons. "Our harvest being gotten in, our Governor sent four men on fowling [bird hunting] so that we might, after a special manner, rejoice together after we had gathered the fruit of our labors. They four in one day killed as much fowl as... served the company almost a week... Many of the Indians [came] amongst us and... their greatest King, Massasoit, with some ninety men, whom for three days we entertained and feasted; and they went out and killed five deer, which they brought... And although it be not always so plentiful as it was at this time with us, yet BY THE GOODNESS OF GOD WE ARE... FAR FROM WANT." Abraham Lincoln the man after true Civil Liberties said in 1863 at the Thanksgiving Proclamation. "When I left Springfield [to assume the Presidency] I asked the people to pray for me. I was not a Christian. When I buried my son, the severest trial of my life, I was not a Christian. But when I went to Gettysburg and saw the graves of thousands of our soldiers, I then and there consecrated myself to Christ." It is a day to give THANKS to the LORD! Speaking of taking an honest look and sobering up to truth...does this apply to looking critically and acknowledging the far- reaching discrepancies between the Emergent Church you defend and Biblical Evangelicalism? The lies that the Emergent (no-moral standard) Church spread in their efforts to make the culturally relevant church experience entertaining and conform to the sinful nature of man demeans the blood sacrifice of Christ and the relevance and implementation of Biblical truths. Thankful for the lies or serious about seeking truth? Do you serve the Lord on Biblical terms or the whims of Emergent cult leaders, who decieve so many into their ideological fallacyland? I care more about YOUR soul and its eternity than Native American Indian history. Keep searching for truth Didymus -earnestly praying for God to call you to Him. It is amazingly ironic to me that you care so much about setting the truth record straight on things that matter so little (like whether or not Native Americans appreciated what the Pilgrims did) and on the big things (like figuring out what Jesus meant by the wide gate/narrow path and which one you're on)... not so much! I am optimistic and joyfully praying for the day you figure it all out. Didy - I care because I once did the same thing and looking back would have appreciated someone challenging me to really examine truth as it is in God's word. I sincerely wish you and your family a Happy Thanksgiving. Happy Thanksgiving Didymus, I wish you and your family well.